At current increasing enrollment and loan rates, testified Steve Eisman (famous for waging war against the subprime-mortgage market in 2008), there could be $330 billion in defaults in the coming decade. "The taxpayers are being taken for a ride on this," Senator Harkin told TIME. "Taxpayers, I think rightfully, are saying, 'Yes, you can take my tax dollars to help educate kids; that's good for us and our country.' But I don't know that the taxpayers want their money to go to institutions to pay the shareholders huge profits." The House's proposed accountability rules only start to address limited Department of Education graduation data and unreliable self-reported school figures. Moreover, Harkin's findings indicate that there is no information available on how private schools spend Higher Education Act student-assistance dollars. While Congress is seeking to create a Consumer Financial Protection Bureau (CFPB) to oversee private student loans, the CFPB would not have jurisdiction over the loans that for-profit colleges make or over Sallie Mae, the largest private student lender. Other for-profit industry ties to Washington remain murky. Last month, House Republicans nominated the only for-profit members — Keiser University chancellor Arthur Keiser and University of Phoenix president William Pepicello — to the Secretary of Education's accreditation advisory committee, the National Advisory Committee on Institutional Quality and Integrity. While direct political contributions from the Career College Association, Apollo Group and Corinthian Colleges Inc. have totaled only $923,000 since 2006, their lobby maintains a strong presence. Issa's story parallels hundreds of others that Senator Harkin's office received recently. The refrain is usually the same: after being lured by aggressive recruitment and advertising strategies, low-income students leave proprietary schools unemployed and trapped in debt. Deanne Loonin, director of the National Consumer Law Center's Student Loan Borrower Assistance Project, has seen for-profit student clients seeking help with loan defaults for nearly 20 years. Not one client, she claims, got a job in his or her anticipated field. "The schools are playing the role of the brokers who are pushing the products on the vulnerable population," Loonin remarked. I met AFL-CIO President Richard Trumka at the national march against SB 1070, Arizona's xenophobic law that institutionalizes racial profiling and scapegoats immigrants for America's economic problems. 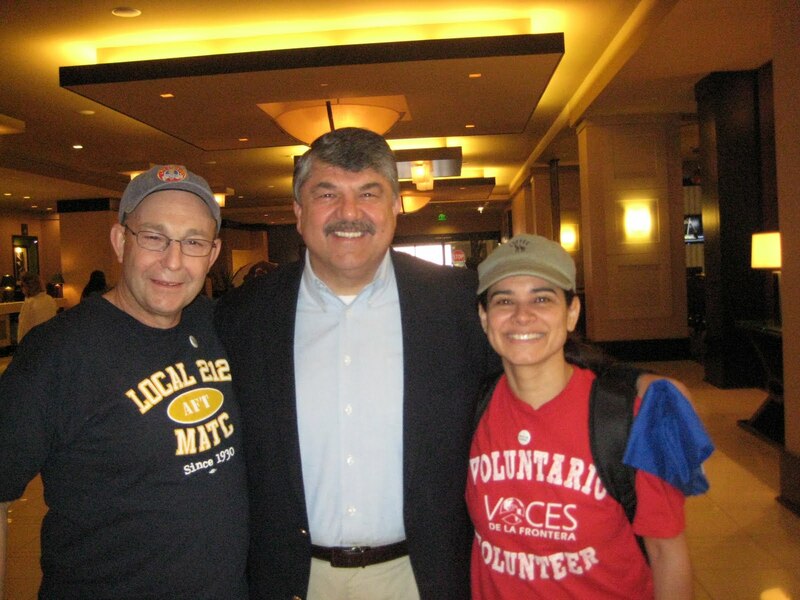 Trumka ,whose parents migrated from Italy, was a keynote speaker at the march and rally in Phoenix of more than 50,000. President Trumka condemned SB 1070 as a cynical attempt to divide the working class by criminalizing some of its hardest working and most exploited members. Blaming immigrant workers for our economic catastrophe is like blaming shrimpers for the BP oil spill in the Gulf of Mexico. An immigrant worker did not move your plant overseas. An immigrant did not take away your pension. A Mexican or Salvadoran or Guatemalan worker did not cut off your health care. His wife didn't foreclose your home. Her children did not crash our financial system. BP was too greedy to drill that well safely. And many U.S. employers are too greedy to pay workers a living wage, or comply with health, safety and labor laws. They've got exactly the immigration system they want -- plenty of workers living and toiling in the shadows, borders that are closed enough to turn immigrants into second-class citizens and criminals but open enough to ensure an endless supply of socially and legally powerless cheap labor. Gripped by our own economic insecurity, it's often hard to see immigrants as mothers and fathers who are just trying to make a living and take care of their families -- people pursuing the same goals and dreams the rest of us have. Maybe it's easier to identify with or side with the rich and powerful. The entire speech is linked here. It is worth reading. All eyes will be on the for-profit-education industry Thursday as the U.S. Senate convenes the first in a series of hearings examining federal spending on proprietary colleges. If you care about online education, it's worth paying attention because for-profits are gobbling up a growing share of the e-learning market. The hearing kicks off at 10 a.m., Eastern Daylight Time, and will be Webcast here. I'll be reporting live from the event on Twitter (@marcparry). If you're on Twitter, you can contribute to our coverage by using the hashtag "#4profit." All tweets with that tag will be published in a box on The Chronicle's home page. For more on the issues at play Thursday, check out this morning's story by Chronicle reporter Paul Basken: "New Grilling of For-Profits Could Turn Up the Heat for All of Higher Education." hearing. Concerned about the disproportionate share of federal student aid flowing to for-profit colleges, several Democratic lawmakers on Monday asked the federal Government Accountability Office to investigate the for-profit institutions, in terms of both quality and finance. “Recent press reports have raised questions about the quality of proprietary institutions,” said the letter signed by the chairmen of the Senate and House education committees and others. Republicans had mixed responses to the request. For-profit colleges have less than 10 percent of the nation’s college students, but get about 25 percent of all federal student-aid disbursements. With for-profit colleges taking in $26.5 billion in federal money last year, up from $4.6 billion in 2000, government scrutiny is becoming intense. Last week, at a hearing of the House Education and Labor Committee, the Department of Education inspector general raised concerns about how accrediting agencies oversaw college credit hours, which determine how much federal aid students can get. On Thursday, the Senate committee will hold the first in a series of hearings on for-profit colleges. Meanwhile, the Department of Education last week proposed a regulatory package requiring greater disclosure by for-profit colleges, and tightening the rules against paying recruiters by the number of students they sign up. The department is still working on a controversial proposal to cut off federal aid to for-profit programs whose graduates do not earn enough to pay off their loans. Monday’s letter asked the accountability office to gather information on the growth of the institutions, their governance, and the kind, and quality, of programs they provide — along with students’ outcomes, completion rates, professional licensure rates, job placement rates and indebtedness. In the letter, the lawmakers asked the accountability office to explore whether existing safeguards adequately protect against waste and fraud, and to make recommendations based on its findings. The letter was signed by five Democrats: Representative George Miller of California, chairman of the House education committee; Senator Tom Harkin of Iowa, chairman of the Senate education committee; Senator Richard J. Durbin of Illinois; and Representatives Timothy H. Bishop of New York and Rubén Hinojosa of Texas. We write to request that the Government Accountability Office (GAO) conduct a review of the for-profit or “proprietary” postsecondary education sector and the sector’s share of revenue derived from Federal student aid funding. The federal investment in the proprietary sector is significant. While this sector accounts for less than 10 percent of total enrollments, it accounts for roughly 25 percent of all Federal student aid disbursed. Recent press reports have raised questions about the quality of proprietary institutions. These questions stem from the rapid growth of this industry over the last few years, reported aggressive recruitment of students by such institutions, increased variety in the delivery methods used to provide education to students, and the value of the education provided by such institutions. On March 30, 2010, President Obama signed the Health Care and Education Reconciliation Act into law. That legislation expanded student aid opportunities for students, including an historic $36 billion investment in the Pell Grant program. The increased availability of Federal student aid, coupled with the significant growth of the proprietary sector, raises the issue of whether current safeguards are sufficient to protect the best interests of students and ensure that the nation’s taxpayers are achieving the best possible return on their investment. · The extent to which proprietary institutions’ revenue is comprised of Federal student aid offered under Title IV of the Higher Education Act as well as other Federal funding sources. Finally, based on your review, we request that you provide any recommendations you believe may be warranted. The first (and probably the biggest) jaw-dropping moment of the congressional hearing with British Petroleum (BP) CEO Tony Hayward occurred when GOP Rep. Joe Barton, the top Republican on the House Energy Committee’s subcommittee for investigations, opened the hearing by apologizing to BP CEO Tony Hayward, saying he’s "ashamed" of the American response to BP’s oil spill. Not to be outdone, WISN's Mark Beiling spent Thursday afternoon ranting about the MMSD in a transparent attempt to divert attention from BP's deadly negligence. According to Barton, asking BP to set up an escrow account to compensate victims of BP's disaster, the largest oil spill in U.S. history, was a criminal action -- a "shakedown" as he put it. Barton's not alone: his comments echo those made by other Republicans in recent days, including Michele Bachmann, Haley Barbour, and Tom Price and were taken directly from a Republican Study Committee statement that characterized the $20 billion dollar escrow account negotiated by BP and the Obama administration for victims of the oil catastrophe in the gulf is a "Chicago-Style Political Shakedown." Beiling joined the chorus reading from the Republican Party's talking points. He minimized the serious of BP's oil spill and the resultant contamination of the Gulf of Mexico by comparing it to the MMSD's release of 23.6 million gallons of a sewage and storm water mix into local lakes and Lake Michigan. His obvious intent was to divert public attention from BP to Beiling's favorite bogey man, the public sector. The BP oil spill, the result of BP's cutting corners to minimize costs and maximize profits and weakened federal regulation, is dumping between 25,000 to 30,000 barrels a day into the Guld of Mexico. That conservative estimate (it may be much higher) is equivalent to the Exxon Valdez disaster every 8 to 10 days. A barrel is 42 gallons. So 30,000 barrels equates to nearly 1.3 million gallons a day. Since the oil rig exploded on April 10th, more than 80 million gallons of oil, almost three times the quantity of sewage Beiling is bemoaning, have been released. And that number is growing daily. The BP oil spill is a human, economic and environmental disaster. Eleven oil rig workers were killed. None were killed by the MMSD. The economic devastation to Louisiana was immediate. The spill has contaminated 100 miles of coastline, polluted coastal wetlands, and threatens national wildlife refuges, the home for many endangered species. The state of Louisiana was also forced to shut down fishing in the area. Commercial fisherman that harvest nearly one billion pounds of fish and 3.2 million recreational fishermen were shut down in the process. The economic carnage does not stop there. The Gulf States, from Mississippi through Florida, have suffered from both curtailed fishing operations to severely reduced tourism. Occupancy rates are down 90% in some regions along the Florida panhandle. The Gulf's beaches are empty. Oil spills tend to do that to tourism. No Lake Michigan businesses were forced to close because of the MMSD's action, no species were endangered and no one lost their jobs. Over the weekend, Bradford Beach was packed with sun-loving Milwaukeans, despite Beiling's blustering. Beiling's tagline should be changed from "Standing up for Milwaukee" to "Standing up for British Petroleum and corporate malfeasance!" ...we have a severely depressed economy — and that depressed economy is inflicting long-run damage. Every year that goes by with extremely high unemployment increases the chance that many of the long-term unemployed will never come back to the work force, and become a permanent underclass. Every year that there are five times as many people seeking work as there are job openings means that hundreds of thousands of Americans graduating from school are denied the chance to get started on their working lives. And with each passing month we drift closer to a Japanese-style deflationary trap. So now is not the time for fiscal austerity. The rest of the article is linked. Not satisfied with a shameful new law that invites, indeed demands, racial profiling, some Arizona politicians are now pushing for a law that would deny citizenship to babies born in Arizona whose parents cannot prove they are legal immigrants. The 14th Amendment, adopted after the Civil War, states: “All persons born or naturalized in the United States, and subject to the jurisdiction thereof, are citizens of the United States and of the state wherein they reside.” It could not be clearer. The Constitution apparently does not matter to these politicians. They also do not seem to care that Arizona is earning a national reputation for intolerance and racism — and if it continues this way will pay an economic price in boycotts of its lucrative tourism industry. When State Senator Russell Pearce first started pushing for a law that requires police forces to stop and check anyone who appears to be an illegal immigrant, he was dismissed as a crackpot. The legislation passed both houses of the Republican-controlled Legislature with distressingly large majorities. Gov. Jan Brewer then proudly signed it into law. Now Mr. Pearce is at it again with this new proposal, meant to end what he calls the “inadvertent and unforeseen” consequences of the 14th Amendment’s citizenship clause. He pins it all on the phrase “subject to the jurisdiction thereof,” arguing that the babies of illegal immigrants — like the children of foreign diplomats — do not have full allegiance to this country, and thus do not deserve automatic citizenship. It is a spurious argument. Mr. Pearce’s bill, we fear, is likely to get a sympathetic hearing in Arizona’s Legislature. Governor Brewer told interviewers this month that illegal immigrants should leave and take their citizen children with them. President Obama, who has criticized the first Arizona law, has so far failed to use his power to block it, though his administration is preparing a lawsuit to do so. He needs to reassert sole federal authority over a rational and humane immigration system, and stop Arizona and other states from creating a crazy quilt of harsh statutes, some crazier than others. Until the president and all people of conscience stand up to these bullies, they will keep pushing. The Constitution and the civil rights of thousands of people must not be violated this way. Should city assist for-profit college? City support for a controversial for-profit college is expected to be voted on for the second time on Thursday. At issue is whether the city’s Redevelopment Authority will issue $11 million in tax exempt bonds to help finance a redevelopment of several properties near North 6th Street and West McKinley Avenue. This would then become the location for a local branch of Everest College, which critics charge poorly serves students while leaving them with high levels of debt. The federal Department of Education, meanwhile, has threatened to clamp down on federal student loans issued to students of for-profit colleges like Everest. The Redevelopment Authority board already voted 6-0 in November 2009 to pursue the bond sale. On Thursday, the board will vote on whether to issue the tax-exempt bonds – which the developer would be responsible for repaying to investors, albeit with a lower interest rate. The school would only occupy about half of the buildings in the overall project, which is being developed by McKinley Avenue LLC. The proposed location for Everest, a 45,000-square-foot building at 1311 N. 6th St., borders on vacant sections of the Park East neighborhood to the south that still haven’t been redeveloped. Much of the land was cleared by the demolition of a freeway spur in 2003. Ald. Milele Coggs, whose district includes the development, opposed the special-use permit the Board of Zoning Appeals granted to Everest in February, allowing it to convert the former Journal Sentinel garage at 1311 N. 6th St. into a college. She argued Everest was a poor fit for the neighborhood and not a residential development as called for in the city’s comprehensive plan. Coggs also questioned how the campus would affect traffic in the area. And like other local leaders, Coggs questioned Everest’s business practices. “This is definitely not the ‘right development’ for the location,” she said. For-profit colleges are often accused of luring students into expensive training programs that fail to prepare them for the job market. According to U.S. Department of Education records, for-profit colleges have a poor record when it comes to student defaulting on loans, and Everest’s record stands out as particularly bad. In 2007, 11 percent of students at for-profit schools defaulted on their loans, as compared to 6 percent of students in traditional, not-for-profit colleges. Everest institutions averaged a default rate of almost 16 percent. Everest is owned by Corinthian Colleges, a national chain of for-profit colleges. In 2007, the company settled a case brought by California regulators by paying $6.5 million. The regulators had alleged the company’s schools were illegally recruiting students by exaggerating the percentages of their graduates who went on to find jobs. Lawsuits in other states, including Florida, have taken the company to task over credits from its programs not transferring to other colleges. Other students have accused Corinthian schools of misrepresenting what their programs offered. Like most for-profit colleges, Corinthian schools are nationally accredited and offer medical and other vocational training. Although the “national” accreditation sounds attractive, says Michael Rosen, head of the Milwaukee Area Technical College teacher’s union and a vocal critic of for-profit colleges, it’s less favorable than the regional accreditations held by traditional colleges. Rosen questions the city’s support of the Everest development, saying its “social cost,” in the form of graduates loaded with student debt they can’t pay off, will outweigh the new tax revenue. Everest is already recruiting applicants for job openings at its Milwaukee campus – for admissions representative, student finance planner, student finance representative, director of admissions, high school director of admissions, director of student finance and director of education. The college already has concrete plans for its first classes. Enrollment begins Sept. 1, and classes start on Oct. 18. The school is planning to enroll 650 students in its first year and hire more than 40 employees. As NewsBuzz reported previously, the U.S. Department of Education is considering a rule that would only apply to for-profit colleges and require their students, on average, to pay off their federal student loans within 10 years using 8 percent of their salary. Otherwise, the school’s students would be ineligible for federal financial aid. The Career College Association, which represents for-profit colleges, estimates the rules could drive many schools out of business by drying up federal funding. The group estimates that programs instructing about 2,000 students in Wisconsin would go under if the rules are imposed. According to The New York Times, the average for-profit college gets about three quarters of its budget from federal aid to students. In 2007, DOE reports, students from for-profit colleges accounted for 41 percent of defaults on federal student loans. For-profit schools say the DOE is creating rules Congress should be required to pass. The Department says it has the authority to make new rules to protect federal financial aid system, though, according to the Bloomberg news service, it delayed releasing a long-anticipated new draft of the rules last week, possibly a sign DOE officials were having second thoughts. In Milwaukee, other such colleges besides Everest have plans to expand or move to the city, including Bryant & Stratton College, an Art Institute and the Milwaukee Career College. The Chronicle of Higher Education reports that most of the Education Department's proposals to regulate for-profit colleges like Corinthian and the Education Development Management Corporation will move forward. But the "gainful employment" regulation designed to protect students from crushing loads of debt, the focus of a multi-million dollar lobbying campaign by proprietory institutions, was not included in the package of reforms. The for-profits argue that tying student aid to student debt loads and incomes would force many of them to close their doors. But the goal of the rule is to protect students from taking on debts they have no possibility of paying back. If the only way for-profit institutions can stay open is by deceiving students into enrolling in costly programs that do not lead to family supporting incomes, they should be shut down. After an intense lobbying effort by for-profit colleges, the Education Department announced Tuesday that it will postpone the release of a rule that proprietary institutions said would shutter thousands of their programs. The rule, which would cut off federal student aid to programs whose graduates carry high student-loan debt relative to their incomes, is one of 14 that the department and college stakeholders have been negotiating over the past eight months. The other regulations, including one that would tighten a ban on incentive compensation for college recruiters, will be made public Friday. In a call with reporters Tuesday, an Education Department official said the agency still plans to hold for-profits accountable for preparing their graduates for "gainful employment," but needs more time to develop an appropriate measure of that outcome. The official said the proposal will be released later this summer, and will most likely be included in a package of final rules due out in November. "We have many areas of agreement where we can move forward," Arne Duncan, the U.S. secretary of education, said in a statement. "But some key issues around gainful employment are complicated, and we want to get it right, so we will be coming back with that shortly." The delay gives for-profit colleges more time to fight the department's proposal to bar aid for programs in which a majority of students' loan payments would exceed 8 percent of the lowest quarter of graduates' expected earnings, based on a 10-year repayment plan. The colleges have already spent hundreds of thousands of dollars pushing an alternative that would require programs to provide prospective students with more information about their graduates' debt levels and salaries. Their lobbying and public-relations blitz has met with mixed success. While the department has not yet abandoned plans to measure graduates' debt-to-income ratios, the rules that will be released Friday would require programs to disclose their graduation and job-placement rates and median debt levels—the approach favored by for-profits. Trace A. Urdan, an analyst with Signal Hill Capital Group, said the delay in releasing the rest of the rule suggested that "the department has heard the message from industry and Congress, and that there was some overreaching." "Clearly, trying to gather more data before proceeding is being responsible," he added. For-profit colleges have complained that the department has refused to release the data it used to justify drafting the rule, and have questioned whether they even exist. The fight over gainful employment comes amid increased federal scrutiny of the for-profit sector, which educates a growing share of students and is highly dependent on federal student aid. On Thursday, the education committee of the U.S. House of Representatives will hold a hearing to examine whether accrediting agencies are doing enough to ensure that students studying online are getting an adequate amount of instruction for the degrees they earn. The hearing will focus on a recent report by the Education Department's Office of Inspector General that questioned the decision of the Higher Learning Commission of the North Central Association of Colleges and Schools, one of the nation's major regional accrediting organizations, to approve accreditation of American InterContinental University, a for-profit college owned by the Career Education Corporation. The Senate education committee follows with a hearing next week focused on the growth of the for-profit sector and the risks that may pose to taxpayers. In a statement issued Tuesday, the chairman of the Senate committee praised the proposed rules. "The federal government must ensure that the more than $20-billion in student aid that these schools receive is being well spent and students are being well informed and well served," said Sen. Tom Harkin, Democrat of Iowa. "For-profit colleges must work for students and taxpayers, not just shareholders." Meanwhile, a top Republican on the panel, Sen. Lamar Alexander, of Tennessee, called the disclosures that would be required by the rules that will be released on Friday "much better than the first approach on gainful employment." Mr. Alexander, a former secretary of education, had threatened to offer an amendment to withhold the funds needed to put the rule into effect if the department followed through with its original proposal. "Secretary Duncan is focusing on a real problem," he said. "Some students are borrowing too much and not getting enough value for what they are paying." But if the department is showing signs that it may soften its stance on gainful employment, it has dug in its heels on another controversial issue: recruiter compensation. During negotiations over the rules, the department proposed striking a dozen "safe harbors" from a ban on compensating recruiters based on student enrollment. It followed through with that proposal in the rules due out Friday, while promising to provide guidance on what is—and isn't—allowed under the ban. Congress outlawed incentive compensation in 1992 following reports that some trade institutions were enrolling unqualified students to receive their federal student-aid dollars. By prohibiting commissions, lawmakers hoped to discourage recruiters from signing up students for courses they couldn't handle. Under the law, colleges may not provide "any commission, bonus, or other incentive payment" to recruiters or admissions officers based on their success in securing enrollments or financial aid. A decade later, the Education Department convened a committee to clarify the rules, which for-profit colleges had long complained were unclear and ambiguous. When the panel disbanded without reaching consensus, the department took action on its own, issuing regulations that outlined the 12 "safe harbors" from the law. In the years since the safe harbors were created, some of the largest for-profit institutions have come under scrutiny by state and federal regulators, and a number of former recruiters have filed lawsuits under a whistle-blower law, the False Claims Act, that accuse colleges of improperly compensating recruiters. In one of the most high-profile lawsuits, the University of Phoenix recently agreed to pay $67.5-million to settle a False Claims lawsuit filed by two former recruiters. Pauline Abernathy, vice president for the Institute for College Access & Success, said the changes in the proposed rule "appear to bring the department's policies more in line with federal law banning incentive compensation." "These loopholes have led to high-pressure and deceptive sales tactics that can leave vulnerable consumers with staggering debt and no way to pay it back," she said. But Harris N. Miller, president of the Career College Association, said he was disappointed that the department didn't include specific guidance in its rule. "This is going to harm students and make lawyers very happy," he said. Most of the other regulations in the package to be released on Friday are aimed at protecting students and safeguarding taxpayers' investment in federal student aid. In many cases, the language mirrors agreements reached during the rule-making sessions. Require colleges to evaluate the validity of a student's high-school diploma if either the college or the secretary of education believes that a closer examination of the diploma is warranted. Strengthen the department's authority to take action against institutions engaging in deceptive advertising, marketing and sales practices. Clarify the states' responsibility in approving and monitoring postsecondary programs. Define a credit hour and establish procedures for accrediting agencies to determine whether a college's assignment of a credit hour is acceptable. The proposal also allows for a credit hour to be measured through learning outcomes instead of the customary use of "seat time." The public will have 45 days to comment on the rules, which are expected to be finalized by November 1 and take effect in July 2011. The World Cup: What happens when the crowds go home? The World Cup is the the world's greatest sporting event. For an entire month, people from every corner of the globe are riveted by these world class athletes and the magic they perform with their feet, their head and a ball. This is why Steve Nash of the Phoenix Suns heads to New York City every summer to play in the city's many soccer leagues and why people everywhere are cramming into bars, clubs, stadiums and pubic squares at insane hours to cheer for their national or adopted favorite team. I love the competition, the international camaraderie and the brilliance of athletes like Messi, Park Ji-Sung, Rooney and Howard. But in a country as poor and unequal as South Africa, it is hard to justify the costs of hosting the games. Once they are over and the cheering stops, South Africa will be left with enormous debts in addition to its overwhelming social and economic problems. This is the first World Cup played on African Soil. But the claims that it is an "African" event ring hollow. In reality it is a sanitized spectacle run by and for multinational corporations and global elites. Whether the administrators and sponsors like it or not, the games are highlighting the gulf between the haves and the have-nots. Take, for example, Royal Bafokeng Stadium, where England and the US met on Saturday night. It cost $82 million to build, and its recently refurbished stands are hosting business executives from some of the world's biggest corporations. While they live it up at the World Cup, in the surrounding 29 villages that make up the tiny Bafokeng kingdom within South Africa, most live in abject poverty despite the region's platinum wealth. Relying on tax subsidies, the South African organizers have built five world-class stadiums, renovated two existing football stadiums and a further three rugby stadiums, and made additional significant infrastructure changes — all at a cost in excess of 30 billion South African rand, double what was predicted in 2006. This is in a country where poverty is extreme: The Gini coefficient of income inequality, a metric on a zero-to-one scale with higher numbers representing greater disparity, has risen from 0.66 in 1993 to 0.70 in 2008 (the U.S., for comparison, is at 0.45). Racial apartheid has been replaced by class apartheid and unemployment hovers around 40%. Scarce public resources have been diverted from much-needed public projects to a spectacle that generates significant revenue — but mainly for FIFA, football's governing body, and big corporations. In presenting FIFA with a "risk-free opportunity on African soil," to quote their bid, the South African organizers structured the tournament so as to allow FIFA to generate vast profits through marketing and broadcasting rights. The result: The 2010 World Cup is already proving lucrative for FIFA — Jerome Valcke, the organization's secretary general, recently announced that income has increased by 50% since the last event. But the economic benefits for South Africans will be very slim. In fact, many citizens — indeed, many Africans of all nationalities — will be excluded, due to expensive tickets and a complicated ticketing system. Though less than 10% of the South African population has internet access, tickets were initially sold online. Local traders have been barred from selling food, beverages, and soccer merchandise outside the stadiums. Local factories were not even awarded the contract to produce the official mascot, Zakumi — instead, the work went to a factory in Shanghai. The 2010 World Cup has gotten off to splendid start with large enthusiastic crowds and stirring performances. With favorites like Brazil and the Ivory Coast yet to play and stars like Kaka and Ronaldo working their magic, these games, despite the controversy over the ball and the noise of the vuvuzelas,, are meeting the expectations of football fans everywhere. The games have also generated enormous enthusiasm among South Africans who are justifiably proud of hosting the event on African soil for the first time. But after the games are over and the money is counted, very little will flow back to the South African communities that need it the most. Why do Glenn Beck and the right wing hate football? “It doesn’t matter how you try to sell it to us,” yipped the Prom King of new right, Glenn Beck. Young people love soccer not because of some kind of commie-nazi plot conjured by Saul Alinsky to sap us of our precious juices, but because it’s – heaven forefend - fun. As for Liddy, let’s be clear. There is not in fact hard anthropological evidence that early soccer games were played with a human head. Interestingly, though, there is an oft-told legend that the sport took root in England in the 8th century because the King’s army playfully kicked around the detached cranium of the conquered Prince of Denmark. Notice that this tall-tale is about Europe not “South American Indians”. I think we’re seeing a theme here. But maybe this isn’t just sports as avatar for their racism and imperial arrogance. Maybe their hysteria lies in something far more shallow. Maybe the real reason they lose their collective minds is simply because the USA tends to get their asses handed to them each and every World Cup. After all, as G. Gordon asked, “Whatever happened to American exceptionalism?” When it comes to the World Cup, the exceptional is found elsewhere. Could Beck, Liddy, and company just have soccer-envy? Is it possible that if the USA was favored to win the World Cup, Beck himself would be in the streets with his own solid gold vuvuzela? I feel that to ask the question is to answer it. In fact, this is as good a reason as any to hope for a mighty run by the US team. It would be high comedy to see Beck and Friends caught in a vice between their patriotic fervor and their nativist fear. Hedge funds have been circling for new carrion to devour in the next economic slowdown and have found a big fat target in the for-profit educational sector. The industry is ripe for the taking. For two decades, for-profit schools have lured gullible students with inflated promises of impressive sounding degrees which they pay exorbitant tuition to obtain. In education's version of the subprime crisis, creative financial aid departments obtain government loans to finance the entire program. There are now over 2 million attending these institutions, accounting for 10% of all higher education in the US, and the profits that have poured in have been absolutely massive. Early investors rode the IPO train all the way to the bank. The problem arises when few students ever achieve these laudable goals. According to government statistics, 55% of US college students obtain a degree within six years. At the University of Phoenix, with 400,000 students, the largest for-profit university, only 18% meet this deadline, only 6% at some campuses, and a mere 4% of online students. Dropouts end up defaulting on loans that can amount to as much as $100,000 for incomplete bachelor's degrees and up to $200,000 for advanced degrees. It now looks like the gravy train is about to end. Secretary of Education Arne Duncan has promised a crack down on the industry, bringing in more regulation and prosecutions of deceptive marketing practices, where degree programs are sold like time shares. The leading accreditation organizations are also having second thoughts about the for-profits, where 95% of the instructors are part time and tenure is unknown. Complaints are rife about shoddy teaching standards and missing doctorates. Take a look at the top listed for-profit universities of Apollo (APOL), Capella Education (CPLA), and DeVry (DV). According to HedgeTracker, top hedge fund holders of Apollo as of 3/31/10 include Chase Coleman’s Tiger Global Management with 6,754,212 shares / $414mm, Lee Ainslie’s Maverick Capital with 5,683,992 shares / $348mm, Ricky Sandler’s Eminence Capital with 1,844,891 shares / $113mm, and John Paulson’s Paulson & Co. with 1,600,000 shares / $98mm. All of the above mentioned hedge funds, except Tiger Global, made HedgeTracker’s Top Hedge Fund list of 2009. Top hedge fund holders of Capella Education include Jim Simons’ Renaissance Technologies with 366,425 shares / $34mm and Maverick Capital with 209,669 shares / $19mm.Top hedge fund holders of DeVry include Ken Griffin’s Citadel Investment Group with 421,284 shares / $27mm and Ravi Kaza’s Seasons Capital Management with 305,223 shares / $20mm. High school and college students are having a tough time finding summer jobs. According to a recent article by Karen Herzog in the Milwaukee Journal Sentinel, however, this precipitous decline in youth employment is a byproduct of the Wisconsin Legislature's decision to raise the minimum wage to $7.50 an hour. Herzog presents a few anecdotes from employers to substantiate her claim. But she fails to square her analysis with any recognition that the record rate of youth unemployment is a national problem that predates Wisconsin’s minimum wage increase. In June 2009 before the minimum wage increase in July 2009 the Bureau of Labor Statistics reported that employment rates among the nation’s teens (16-19 year olds), especially boys, had reached historic lows. During June, the employment rate (seasonally adjusted) of all 16-19 year olds in the nation was estimated to be only 29.2%, meaning that only 29 of every 100 youth ages 16-19 were employed in any type of job in this month..
Over the October-November 2007 to November-December 2009 period, the number of employed teens in the U.S. declined by nearly 25% while the number of employed 20- 24 year olds fell by nearly 11%. Job loss in relative terms (-25%) among the nation’s teens in the Great Recession is greater than it was for all workers in the Great Depression of the 1930’s (1929-1933). The employment losses for young workers far exceeded those of all other age groups. In fact, the June 2009 employment rate of teens was the lowest ever recorded in the 62 years of employment data that are available from the monthly Current Population Survey dating back to 1948. Herzog presumably ignores this reality because to acknowledge it would undermine her contention that Wisconsin’s minimum wage increase is the cause of high youth unemployment. Or if she acknowledged it, she would have to make the absurd argument that fear of an increase in Wisconsin’s minimum wage to $7.50 caused employers in every state, several of whom have a higher minimum wage than Wisconsin, to cut back on youth employment..
Attributing high youth unemployment to Wisconsin’s minimum wage increase ignores recent research that indicates that incremental increases in the minimum wage do not undermine employment. Studies of states that actually raised the minimum wage in the early 1990s by economists David Card and Alan Kreuger found no increase in unemployment. Youth unemployment is a national problem. It is likely to remain a serious problem without a federal youth jobs program. Blaming it on incremental increases in the minimum wage is inaccurate. It may encourage policy makers to attempt to reduce the minimum wage, but it won't help young people find jobs or earn income. Eisman, a blunt, no-frills portfolio manager at FrontPoint Financial Services Fund, a Morgan Stanley subsidiary, became an overnight sensation as one of the main characters in Lewis' latest. After witnessing the first wave of subprime madness in the 1990s, Eisman grew skeptical of the industry as a whole, Lewis writes. Then, when subprime surged again in the 2000s, he put his knowledge to work. Needless to say, he's a lot richer than he was two years ago. The for-profit education sector has soared over the past decade, making companies like ITT and Apollo Group into heavyweights. Driving much of the growth, Eisman explained, was the sector's easy access to federally guaranteed debt through Title IV student loans. In 2009, he said, for-profit educators raked in almost one-quarter of the $89 billion in available Title IV loans and grants, despite having only 10 percent of the nation's postsecondary students. Another similarity between subprime lending and for-profit education is this, Eisman said: Both push low-income Americans into something they can't afford—in the schools' case, pricey programs that leave the students heavily in debt; what's more, the degrees they get mean little in the real world: "With billboards lining the poorest neighborhoods in America and recruiters trolling casinos and homeless shelters—and I mean that literally—the for-profits have become increasingly adept at pitching the dream of a better life and higher earnings to the most vulnerable." Eisman went on to cite the industry's dropout rates of 50-plus percent as another sign of poor quality; the numbers are likely understated, he added, given that the industry reports them voluntarily. "How good could the product be if dropout rates are so stratospheric?" he asked. "Default rates are already starting to skyrocket. It's just like subprime—which grew at any cost and kept weakening its underwriting standards to grow." How does this kind of industry even stay in business? That, Eisman asserted, has much to do with accreditation. There are two main tiers of college accreditation: national and regional—the latter being the more valuable. (Big schools like Yale and the University of Michigan are regionally accredited.) As Pulitzer Prize-winner Dan Golden has reported, for-profit colleges with the weaker national accreditation have started acquiring financially troubled colleges for their regional accreditation. In a Bloomberg report, Golden cites ITT's acquisition of New Hampshire-based Daniel Webster College in June 2009 for $20 million, a purchase that could ultimately reap $1 billion or more for ITT. Eisman saved the ugliest part for last: As he sees it, the industry's era of massive profits—ITT is more profitable on a margin basis than Apple, he notes—are about to end, thanks to new government regulations in the pipeline. He predicts big hits to the per-share earnings of Apollo Group, ITT, Corinthian Colleges, Education Management Corporation, and the Washington Post Company—which owns and relies on Kaplan for profitability. For ITT and Corinthian, Eisman foresees 2010 losses of nearly 40 to 50 percent. Regarding EDMC, he noted in his prepared remarks that the company's 2010 fiscal estimate is "massively negative." Not all experts on the for-profit education foresee such an ominous future. Trace Urdan, a managing director at Signal Hill who analyzes the industry, told Mother Jones earlier this week that pending regulation from Washington could indeed complicate the future for for-profit colleges. He added, however, that "if you're short on the industry right now, you think there's a game-over scenario on the way"—something Urdan himself doesn't necessarily see happening. Should the Education Department strongly crack down on for-profit schools, Urdan said he predicted losses of 8 to 12 percent—far less than Eisman's 40 to 50 percent projection. Andy Kroll is a reporter at Mother Jones. For more of his stories, click here. Email him with tips and insights at akroll (at) motherjones (dot) com. 431,000 net new jobs were created in May. But almost all of them, a whopping 411,000, were temporary U.S. Census jobs. Private employers added only 41,000 new jobs in May, the lowest total since the start of the year. Overall, the unemployment rate dropped to 9.7 percent, down from 9.9 in April., according to a report released this morning by the U.S. Department of Labor. AFL-CIO President Richard Trumka said the low number of private-sector jobs is further evidence the recovery is still fragile. "The Economic Recovery Act saved us from a second Great Depression, but it was not sufficient to power strong and sustained job growth, and its effects are expected to wane in coming months." He called on Congress to do more to create jobs and sustain the recovery. Most immediately, Congress must move quickly to extend unemployment benefits, restore health care benefits for the unemployed and provide aid to states to maintain jobs and vital services. State and local governments shedded, 22,000 jobs in May. Without further action to offset state budget shortfalls, these job losses will undermine temporary gains from federal spending. The underemployment figure, which includes those who are too discouraged to look for work or are working part-time out of economic necessity, dropped to 16.6 percent in May, from 17.1 percent in April-some 27 million U.S. workers without jobs or full-time work. Wile temporary federal government jobs are rising because of the Census, permanent local government jobs are going away. State budget cuts could lead to as many as 900,000 jobs lost in 2010. And Congress decided last week to do nothing about that, cutting money in a jobs bill for the states to balance their Medicaid budgets. Economists say monthly job creation must be 350,000 or more just to begin to make a dent in the unemployment rate. The number of long-term unemployed workers continues to grow. In May, some 6.8 million U.S. workers were out of a job for 27 weeks or longer, up from 4 million a year ago. In May, 46 percent of unemployed workers had been without a job for 27 weeks or more. The long-term jobless figures clearly show how important it is that Congress extend unemployment insurance (UI). Late last week, the House voted to extend unemployment benefits to millions of long-term unemployed workers who have been jobless longer than 26 weeks. But the Senate failed to vote on the measure before going on recess, meaning up to 1.2 million workers will have lost their unemployment insurance by the time the Senate returns from vacation. Speaking earlier this week at Carnegie-Mellon University in Pittsburgh, Pa., President Obama said it is critical lawmakers extend unemployment insurance for several more months so that Americans who’ve been laid off through no fault of their own get the support they need to provide for their families and can maintain their health insurance until they’re rehired. If you give money to someone who is unemployed, they are going to spend it the next day. America’s workers have paid far more than their fare share for the economic crisis - they’ve paid with their jobs, with their homes and with billions of dollars to Wall Street. Today’s challenge is jobs. Unless Congress addresses this challenge with the focus and energy they brought to rescuing our banks, not only will a generation of workers be doomed to unemployment and the recovery itself put at risk, but dealing with our long-term fiscal problem will be all the more difficult. Former Secretary of Labor Robert Reich points out that there is world of difference and a lot of hurt between entrepreneurial zeal and self-employed desperation.